Story and photos courtesy of Phil White, Lake Willoughby, Vermont. 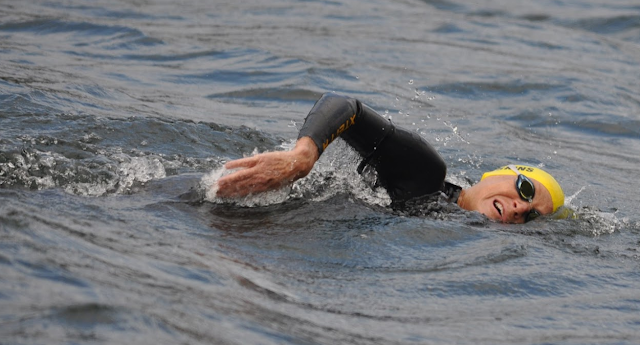 Phil White, Director of the Kingdom Games and the Northeast Kingdom Open Water Swimming Association, has won the bid to host the 2019 United States Masters Swimming Long Distance National Championship Festival 1 Mile and 5 Mile on August 16th and 17th 2019. 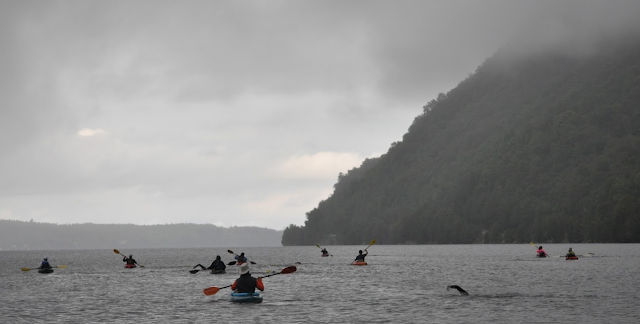 "We anticipate 100 swimmers and 100 kayakers will be drawn to Lake Willoughby from around the United States and Canada. It is a great opportunity to showcase this majestic, pristine lake which is featured in our annual NEK Swim Week. Last year, Lake Memphremagog was the venue for the 10 Mile US Masters Swimming Long Distance National Championship. We are pleased to partner with USMS to host these National Championships." Daily News of Open Water Swimming: You have had some interesting participants in this swim including canine athletes. Who are some of the many people who have surprised or inspired you the most on this particular swim? Phil White: Bill Pease of Berkeley, California who won the men's skins in 2014 at the age of 61. Bill has been swimming Willoughby regularly since 2011 and typically comes in 1st, 2nd or 3rd among the men. It was his idea to swim Caspian the day after Willoughby. That was the start of the NEK Swim Week. Swimmers like Paula Yankauskas who started swimming Willoughby in 2010 in a wetsuit after swimming the 3-mile Kingdom Swim also in a wetsuit. She moved up in distance, tore off her neoprene, swim the length of Memphremagog and then swam the English Channel. The 'kids' including 16-year-old Emma Otto-Moudry, of Ithaca, New York who set the record for a skins Willoughby crossing at 1:53:39 with Don Houghton, Jr. paddling. She went stroke-for-stroke, side-by-side with Charlotte Brynn before pulling away in the last half mile. 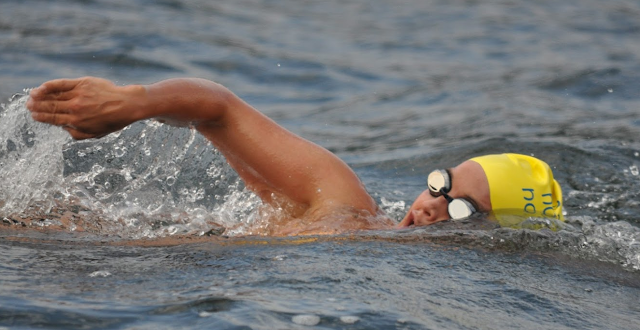 12-year-old Vera Rivard swam the length of the lake last year in the middle of the pack. In doing so, she became the youngest to cross the lake. This year she won the race, tied with Brynn, with a time of 2:21:16. At the same time, her younger sister Margaret came in third and became the youngest at the age 10, to swim the length of the lake. Kevin Sullivan, a triathlete from Chelmsford, Massachusetts who served for many years on the board of United States Triathlon Association, quietly appears from year to year and frequently posts the fastest time of the day, albeit in a wetsuit. Kevin and his wife Patsy are UVM Hall of Famers in swimming and, I think, rock jumping. Charlotte Brynn, has won several Willoughby Swims and has been an inspiration to some of the younger swimmers who have participated in the swim. Daily News of Open Water Swimming: Who has swum across the lake the fastest? Who has swum across the lake taking the most time? Phil White: See above for fastest. The slowest time was posted by local attorney Jill Mathers, with a time of 3:32:02 which she posted in 2012. She's never in a hurry and loves her time in the water. Her ex-husband was kayaking for her. He is now happily owner and manager of Mike's Tiki Bar in East Burke with 30 beers on tap. Daily News of Open Water Swimming: Has anyone completed a two-way crossing of Lake Willoughby? Phil White: Shannon House Keegan is the first known double crosser. In 2012 she came in second in the 5-mile race, had a burger, chatted with friends, and swam back the other way. Last year, Janet Harris double crossed with paddlers Gary Golden and Don Houghton, This year, as previously reported, five swimmers double crossed with Charlotte Brynn the fastest, and Vera Rivard at age 13 being the youngest to double cross Willoughby. Daily News of Open Water Swimming: What direction do the winds usually blow? Phil White: It's about even, we never know. Which is why we call the direction of the swim at 8 am on the morning of the swim. But what makes this swim really fun is we swim with the wind. Even light winds get compressed in the gap, Waves get larger, you can feel the water roll, and you the current gives you a boost. Daily News of Open Water Swimming: Has anyone attempted the swim doing butterfly? Phil White: No, not yet. Daily News of Open Water Swimming: On the day of the swim, what do you do and what time does your day start and end? Phil White: It's gotten pretty simple. I'm up at 5 am, loading up the truck, get to north beach by 7:30 am. Call the direction at 8 am, launch my boat by 8:30 at the boat ramp, cover the swimmers in the water, come in to South Beach long enough to grab a sandwich and some fresh steamed corn, and head out on the water. I'm home by 5 pm. White Cap Campgrounds makes us all sandwiches. They give us their fire pit to host lunch and allow us to steam corn (we have a gas boiling grill given to me by some friends from Levi QC. Daily News of Open Water Swimming: You always give unique and meaningful awards at the Kingdom Games events. What awards do you give at this event this year? Phil White: We give out cedarwood medals, which we call Woodals. Slabs of beef jerky made by Brault's Slaughterhouse, a jugs of maple syrup from Couture's B&B and Sugar Shop. We also award a six pack of ski tickets at Burke Mountain to the male and female winners.